Subcompact: The car originally was intended as a five-door variant of the Europe-only three-door MiTo. It is now expected to be a new model, which could be imported to North America from Italy beginning in 2013. 4C: Marchionne calls it "the first Alfa Romeo car to re-enter the U.S. market." His wish is to respect the end-of-2012 deadline, but the first units could be shipped to U.S. dealers in early 2013. The 4C is a "baby" 8C, with a carbon-fiber body and a 250-hp, turbocharged, 1.8-liter direct-injection gasoline inline four-cylinder engine driving the rear wheels. Alfa plans a total production of about 5,000 units a year of the 4C two-seat coupe, whose target price is below 40,000 euros (about $57,000) in Europe. 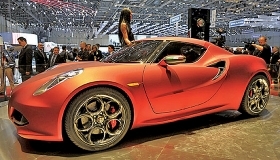 The 4C will go on sale in Europe at the end of 2012 under current plans. Giulietta: Alfa's compact hatchback would come to North America when it's refreshed in 2013. The Giulietta, launched in Europe in July 2010, was the first vehicle on Fiat's new Compact platform. Chrysler, Dodge, Jeep and some Alfa models will use a longer, wider version of the platform, called CUSW, for Compact U.S. Wide. Giulia: In the past 18 months, Marchionne first approved but then killed three styling proposals for the mid-sized Giulia sedan. The styling work is still far from a design freeze, thus the Giulia sedan would debut at the end of 2013 at the earliest. The wagon likely would come in 2014. The Giulia sedan and wagon are set to be built in the United States and exported to Europe. They will replace the slow-selling 159 sedan and Sportwagon models, which Alfa discontinued at the end of May. The two Giulias, which are based on the CUSW platform, will have transverse engines and front- or all-wheel drive. Roadster: Alfa is still considering a two-seat roadster to go into production in 2013. The company has yet to choose a platform and factory for the car. One option is Chrysler's LX rear-drive platform, used for the Chrysler 300, and the Brampton, Ontario, assembly plant. Compact crossover: At the end of 2012, Fiat will begin building a compact crossover for Alfa based on the CUSW platform at its Mirafiori plant in Turin. Shipments to the United States are expected to begin in the spring of 2013. Mid-sized SUV: Fiat seems to have abandoned a plan to develop an Alfa sibling with the replacement for the Jeep Liberty. Also killed was an Alfa sibling of the Jeep Grand Cherokee large SUV. Large sedan: Marchionne's most recent Alfa product plan calls for a large sedan that Chrysler could build in the United States using a stretched variant of the CUSW compact platform. The model could appear in 2014.